← Is evo loosing credibility, power? 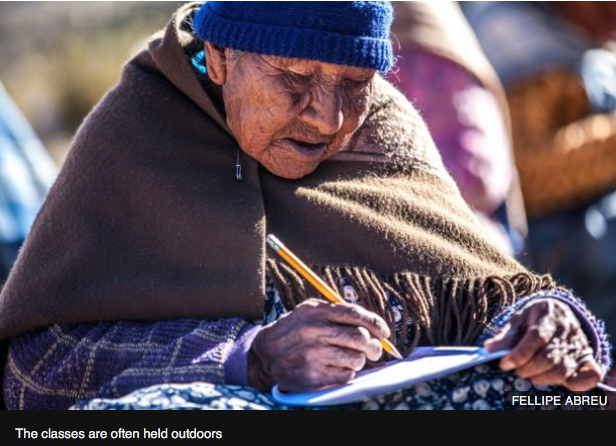 “Reading and writing were forbidden,” says Quintim Pulma, 83. But now things are different for Mr Pulma. “These days, I can study and prove to people that I’m capable of doing anything,” he says. 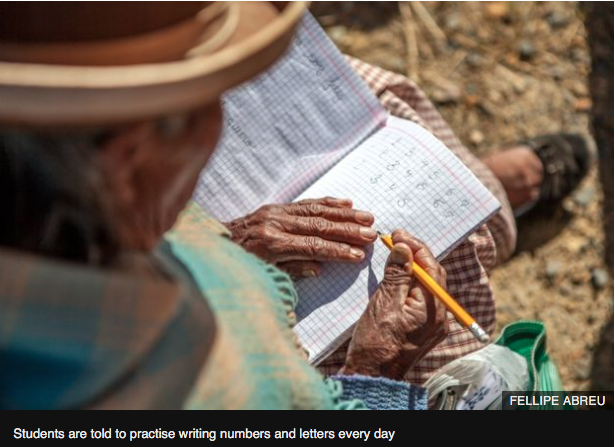 Mr Pulma is one of 39 elderly students in a literacy group in El Alto, Bolivia’s second largest city. 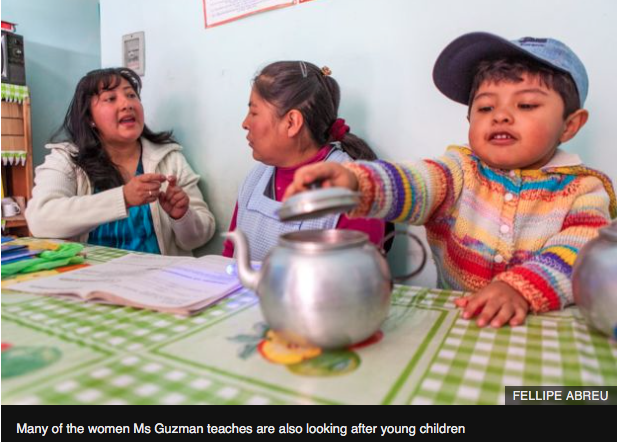 Their group is part of the “Yes, I can” adult literacy campaign which was launched in Bolivia 10 years ago. Most of the students are women over the age of 50 from a poor, rural background. Officials say that it is thanks to the “Yes, I can” programme that illiteracy rates dropped from 13.28% in 2001 to 3.8% in 2014, when the last census was conducted. 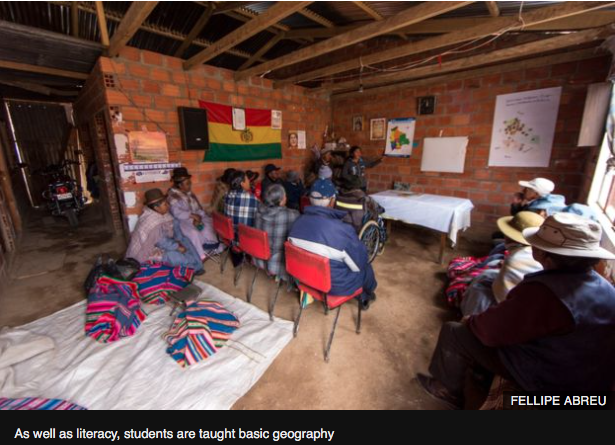 This means that Bolivia is now among the countries considered to have eradicated illiteracy by Unesco’s standards, which requires countries to maintain a rate of illiteracy of below 4%. 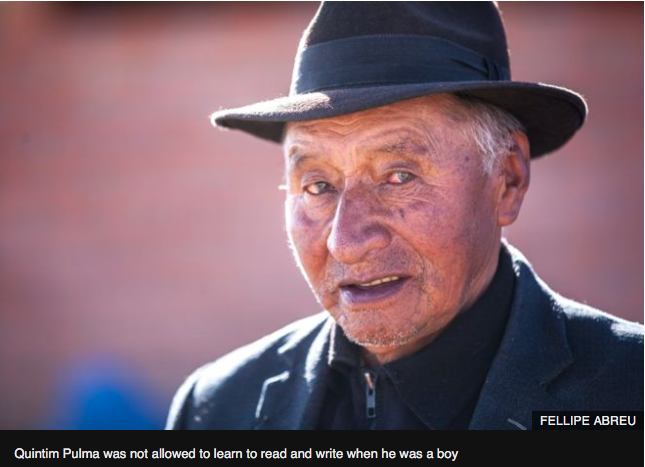 Bolivia’s left-wing President, Evo Morales, had made eradicating illiteracy one of his main priorities when he came to office in 2006. In order to achieve it, he turned to ideological allies Cuba and Venezuela for help. Cuba helped with teachers and teaching materials and Venezuela provided financial assistance. 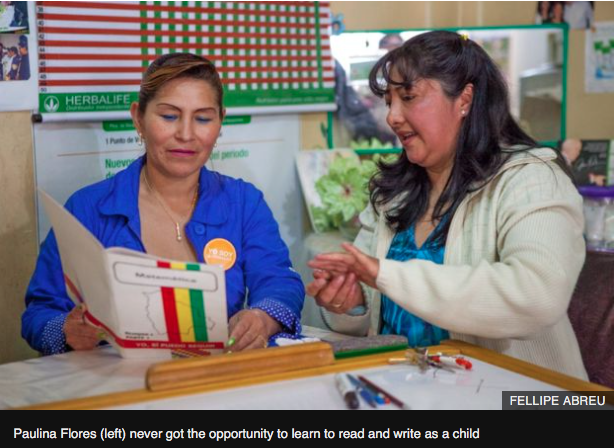 As the Bolivian government found the results to be positive at a relatively low cost of 18m bolivianos per year (£2m; $2.6m), it decided to go ahead with the second phase of the literacy programme, called “Yes, I can carry on”. In this second phase, the students who have spent three to six months learning to read and write spend another two years further deepening their knowledge of maths and literacy and the basics of natural sciences. “Yes, I can” was originally developed in Cuba by educator Leonela Relys and relies on local facilitators to go into the communities to teach literacy with the help of audio visual aids. The teacher is at the heart of the programme. Keyla Guzman Velez is one of them. 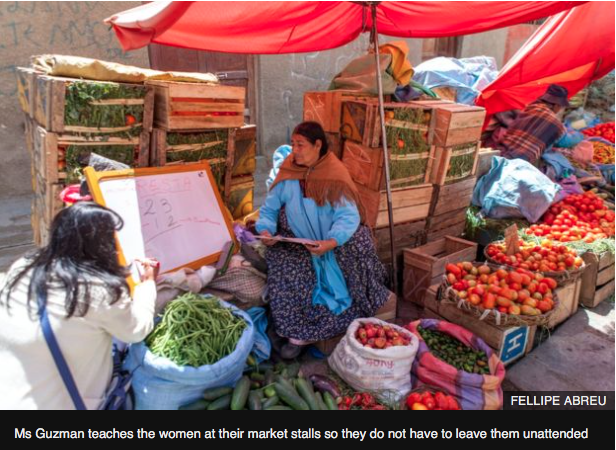 She lives with her husband and three-year-old son Josue next to Rodriguez market, the largest food market in La Paz. 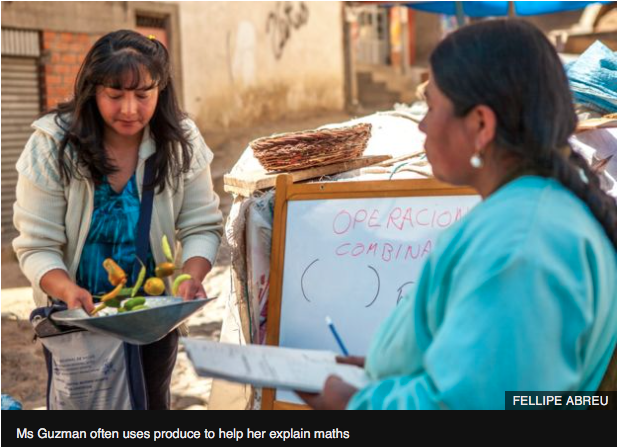 Ms Guzman noticed that many of the women who spent long days working at the market could neither read nor write, never mind do simple maths. She set out to teach them basic literacy but soon found that they were not willing to attend classes after work. As most of the women started at 05:00 and did not finish before 19:00, there was just not enough time, they said. Nor were they willing to leave their stalls where they just about made a living for any length of time. 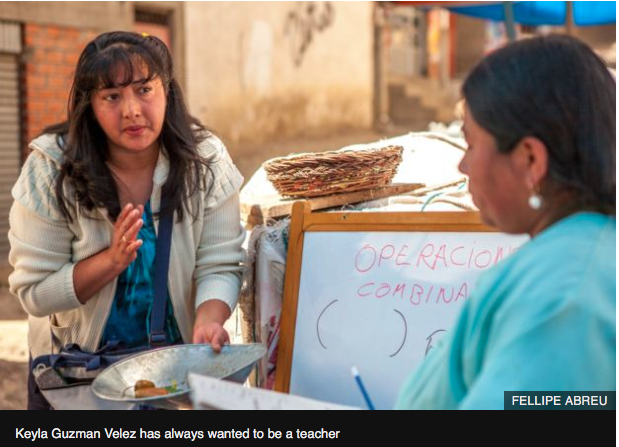 Ms Guzman says she realised she would have to adapt to their needs if she were to succeed. 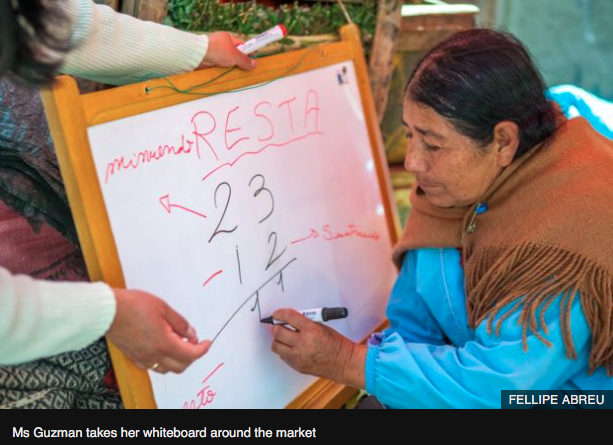 So Ms Guzman asked each one of the women what would be the best time to stop by their stall and did a daily round of the market with a small whiteboard. One of the women she teaches is Paulina Flores, 49. 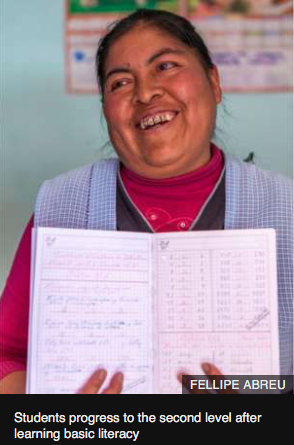 “I only got a chance to study thanks to our teacher, who came to where we were,” she adds. The programme takes dedication. Students have to practise reading daily, as well as writing and doing simple sums. In the “Yes, I can continue” course, students learn to understand longer texts and construct complex sentences as well as multiply and divide. They are also taught basic geography, history and biology. But Ms Flores says for her it is all worth it as she now hopes to be able to realise her childhood dream of going to university to study physiotherapy. We should not forget that the Cuban/Venezuelan “help” has strong political indoctrination and there was also evidence that their “literacy” program was fake in some cases, they only “taught” people to write their names … only that, so lets not forget the cheap demagogue of the populists who have wasted billions of dollars and want to remain in power forever. Lets nor forget that Castro is regarded as one of the main rich people on the world … Cuba has not reached the levels that they were promised …. the only rich are the socialist leaders, a big farce that uses the ignorance of the voters to remain in power. 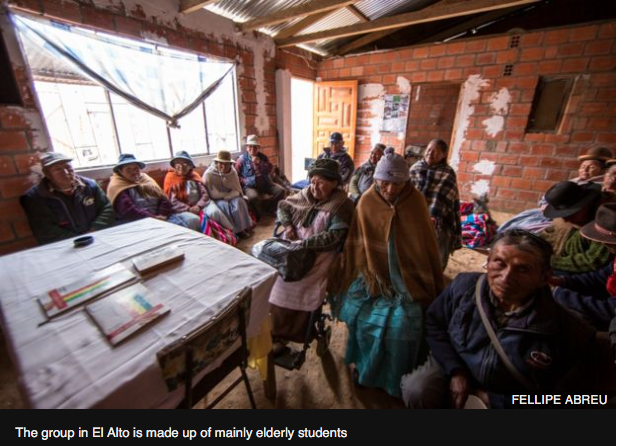 This entry was posted in Bolivia and tagged demagogue, education, elderly. Bookmark the permalink.